An official withdrawal occurs when you, as an enrolled student, decide you must drop all classes and leave the University in a given term after the term begins. If you must leave, you are required to notify the University through the withdrawal process and then cease attendance in all classes and/or academic activities. All students will be responsible for the tuition and fee charges associated with the class(es) and other charges related to attending the University. Determine if you will be required to obtain grading information. If so, you will need to submit Instructor Grade Input forms to all of your instructions and attach the completed forms before completing your Official Withdrawal Request. For more information on submitting grades click here. Before following the steps below, contact your Academic Advisor or Academic Dean’s office for additional information or with any questions. Log into your ConnectCarolina Student Center. 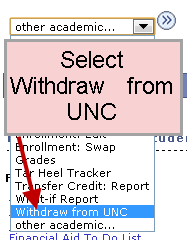 Select “Withdraw from UNC” in the Other Academic… drop down box and select the button. Click “Submit an Official Withdrawal Request” link. Complete the form, attach grades if necessary, read and click the Form Message check boxes and press the Submit button at the bottom of the form. Note: The Withdrawal Submit Date field will auto-populate with the today’s date. This submit date is your Official Withdrawal Date. Important: As of this official withdrawal date, you are no longer eligible for academic and campus services. Please review the Impacts of Withdrawing before submitting your official request and contact your Academic Advisor or Academic Dean’s Office with any questions. Read the confirmation email that will be sent to your UNC email upon submission. Go to your Student Center. Locate the Other Academic drop down arrow to view additional tasks. 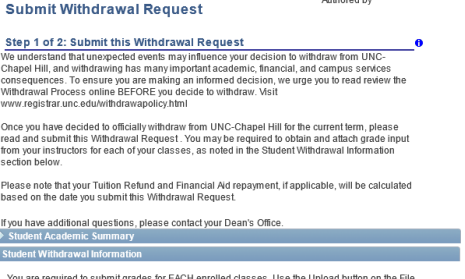 Select the Withdrawal from UNC option from the drop down list. The Student Academic Requests menu will appear. To generate a withdrawal, click on the Submit an Official Withdrawal Request link. The Submit Withdrawal Request form appears. Note: Be sure to read all instructions on the form. Read the instructions carefully and completely before beginning the Withdrawal process. optional Review your Student Academic Summary.To view click the Arrow next to the Student Academic Summary label. Go to the Student Withdrawal Information section and complete the fields. a. The Withdrawal Submit Date field will auto-populate with the today’s date. This submit date is your Official Withdrawal Date. Important: As of this official withdrawal date, you are no longer eligible for academic and campus services.Please review the Impacts of withdrawing before submitting your official request. b. Use the Will you return to UNC-Chapel Hill field to select a choice about your future intentions. Note: If you withdraw from a fall or spring term and wish to return to UNC-Chapel Hill in a future term, you must apply for readmission. If you withdraw from a summer term, readmission is not required. Contact your Academic Advisor or Academic Dean’s Office for more information. d. Enter a Withdrawal Explanation. Upload a grade form for each class in which you are enrolled if required.Note: If grades are required click here for more information. Answer any Form Messages.The Form Messages are contains messages that you will need to read to complete the official Withdrawal form. The messages will require you to acknowledge policies as well as identify any additional tasks that need to be completed before submission.Important: You must click on each form message to successfully complete a Withdrawal Request. Additionally, it is very important that you follow up as directed by any Form Message. Add Comments to the Withdrawal Form.Comments can be used to communicate with student advisors, Deans Office(s), and the Registrar’s Office. The Student Withdrawal Request is then sent to the appropriate office for review and processing. You should continue to check your UNC-CH email and be alert for emails requesting additional information in order for your Withdrawal Request to be processed. Simply submitting your request does not complete the process. You will receive another email when your Withdrawal Request has been processed by the Office of the University Registrar. Please allow up to two weeks for your request to be reflected in ConnectCarolina. Important: It is necessary to carefully read the Step 2 of 2 “Submit this Withdrawal Request” and follow the instructions.